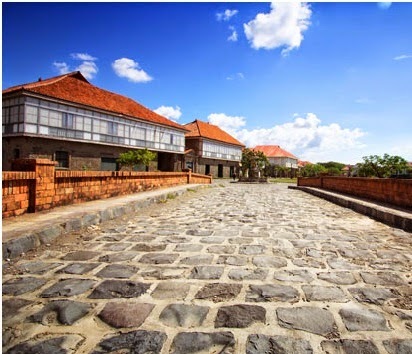 Las Casas Filipinas de Acuzar is built on 400 hectares of land in the town of Bagac, in the south western part of the province of Bataan, with a total land area of 231.20 sq. kms. or 16.5% of Bataan’s total land area. It is about 157 kms. north western part of Manila along the National Highway. Bagac is one of the smallest and oldest towns of Bataan. In the early part of the 17thcentury, even before the coming of Dominican friars to the island, this town has already been existent, although it did not have an official name yet. This town formerly belonged to Mariveles, another town in the province of Bataan. It also had once become a barrio of Morong, Bataan for the reason that it could not stand on its own because of its population and income. Houses, dating from the 18th to 19 centuries, constellate on this recreated village of cobblestone streets, small plazas and outdoor sculpture, breathing new life and presenting refurbished dignity. Relocated from their original sites, they look at once curiously alike and radically different: powerful testimonies of the past, they meet at and diverge from various visual and architectural points and by extension, with the way once kept and maintained domestic histories and human lives within their walls. Once owned by the socially and economically elect of their time, the awe inspiring structures, around 27 at latest count, flirt with nostalgia and somehow, with notion that the past, seen through the prism of our mundane concerns, is better than the present. A living museum of Philippine customs and traditions are re-born in a community typical of the 18th to early 20th century Philippines. Historical Principalia or noble class mansions, House of Stone or Bahay na Bato and Wooden Stilt houses that once, were old and decaying architectural pieces of a bygone era and slowly fading into the background of modern urban life are now, restored in a picturesque setting reminiscent of a Juan Luna or Amorsolo paintings. These architectural treasures that have been carefully and painstakingly reconstructed from different parts of the country and rebuilt, “brick by brick” and “plank by plank”. Currently, there are twenty seven heritage architectures, each full with memories and history. Walking along village cobblestone streets or riding one of the caruajes (horse-drawn carriages) commands a feeling of nostalgia and wonder, romance and appreciation of simple living at its best. At Las Casas Filipinas de Acuzar, the legacy of our forefathers and the beautiful Filipino traditions live on. 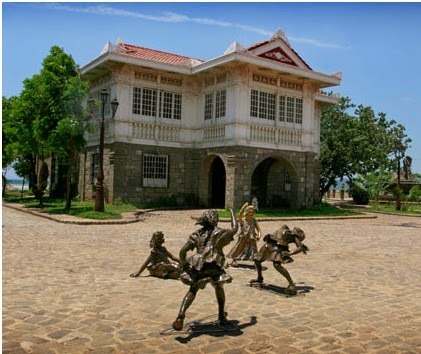 A showcase of Filipino talent, ingenuity and craftsmanship, Las Casas Filipinas de Acuzar takes pride in the past... And keeps its hope for the future.